The REACH social platform aims to collaborate with other projects and initiatives that address questions related to participatory approaches to culture. CINE see the past, imagine the future. CINE (Connected Culture and Natural Heritage in a Northern Environment) is a collaborative digital heritage project that aims to transform people’s experiences of outdoor heritage sites through technology, building on the idea of “museums without walls”. CultureLabs - An Horizon2020 Research and Innovation project which started in April 2018. The project aims at developing a novel methodology and an ICT-empowered infrastructure towards systematizing and facilitating the organisation and wider deployment of participatory projects through the provision of specialised toolkits that offer stakeholder-appropriate ingredients and recipes for social innovation through cultural heritage. CultureMoves - CultureMoves is a user-oriented project that aims to develop new digital tools to enable new forms of touristic engagement and educational resources by leveraging the re-use of Europeana content, with a special focus on content related to dance and performing arts. eHERITAGE - Expanding the Research and Innovation Capacity in Cultural Heritage Virtual Reality Applications. 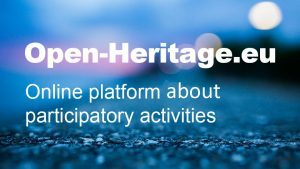 eHERITAGE project contributes to the spread of knowledge in the fields of history and arts by creating applications for cultural heritage sites. EUCANET - European Agencies Network for citizenship, inclusion, involvement and empowerment of communities through the urban transformation process. The project sustains active citizenship, enlarging civic involvement and commitment to the decision-making processes and explores how the urban political process can contribute to tighten the connection between the local and EU level. Europeana Migration presents photographs, artworks, documents, sounds, videos and more on the topic of migration to, from and within Europe, gathered from museums, galleries, libraries, audio-visual archives and archives across Europe. I-Media-Cities is is a Horizon 2020 project to share, provide access to, and use cities' digital content, turning it into the lever of novel approaches to multidisciplinary research, to business innovation and to the overall accessibility of the European Cultural Heritage. Kaleidoscope - The project aims at leveraging photographic content in Europeana depicting the 1950s in Europe, connecting today’s citizens with the post-war generation whose dreams of a better life led to the establishment of the European Union. It will showcase the value of interacting with and reusing cultural material, accessible through Europeana, offering innovative tools for personal user interaction, collections and database management, apps and dissemination/education tools. Multaka Project - Museum as Meeting Point – Refugees as Guides in Berlin Museums. A collaboration between the Museum für Islamische Kunst, the Vorderasiatisches Museum, the Skulpturensammlung and Museum für Byzantinische Kunst and the Deutsches Historisches Museum. Net4Society - Net4Society is the international network of National Contact Points for Socio-Economic Sciences and the Humanities (SSH); it is composed of National Contact Points for the Societal Challenge 6 "Europe in a changing world: inclusive, innovative and reflective societies" - a programme part of Horizon 2020 that is to a large extent driven by SSH research aspects. Net4Society actively supports networking in the SSH research community and offers help in every respect of Horizon 2020 consultation. It includes the European and International National Contact Points of 60 countries. PLUGGY EU Project - The new social platform to enable people to bring out and share their heritage online. ROCK is a Horizon 2020 project to develop an innovative, collaborative and circular systemic approach for regeneration and adaptive reuse of historic city centres. Roma Online Visual Tool is a web-platform that includes the visual representations of the Roma minority of the modern Romanian territories as they appear in the Europeana collection in the 19th and 20th centuries. The research project on which it is based, has investigated the ways in which the stereotypical, repetitive representations of the Roma help explain the current underprivileged situation of this community in Europe and in Romania in particular. RUINS - Project objective is to give "the second life" to the medieval ruins through modern management and attributing contemporary, socially useful functions, while preserving the historical value of these sites. The project aims to develop and disseminate transnational guidelines and integrated model of contemporary use, modern management and protection of medieval ruins in Central Europe. TAKE PART is a network of researchers and professionals engaged in the investigation of contemporary forms of cultural participation. The Nomad Creative Projects is a leading travel resource where destination inspiration is combined with social, economical, political and cultural reporting. The vision of The Nomad Creative Projects is to promote and offer a platform on which each artists and projects can present itself to all audiences. Virtual Multimodal Museum (ViMM) - High-visibility and participative Coordination and Support Action (CSA), funded under the EU Horizon 2020 programme (CULT-COOP-8-2016). ViMM brings together Europe and the world’s leading public and private sector organisations working on Virtual Museums and in the wider sector of Digital Cultural Heritage, to support high quality policy development, decision making and the use of technical advances.